This site was created in 2001 for the Nashville 'supergroup' SWAG. SWAG (Robert Reynolds, Jerry Dale McFadden, Scotty Huff, Ken Coomer, et al) is currently 'resting'. "Goodnight Rock&Roll" - Robert Reynolds' new release! "One thing I love about Reynolds’ music is that he is not one to pigeon-hole himself in to one style of music, he has a love of different genres of music and whilst in one song he can be exploring his liking for rock music, in the next he can be delving in to his country-bluegrass roots." You'll also find information on The Mavericks, plus video links. Enjoy your visit. The Mavericks 2017 tour dates are on our Shows page. Tour date info is also on The Mavericks' website - and there's a shop there too. See here for info on reissue of first album. Michael Guerra (accordion), Ed Friedland (double bass), Max Abrams (sax), Julio Diaz or Scotty Huff (trumpet). SWAG was founded in 1996 by Robert Reynolds & Jerry Dale McFadden. See Band page. or download it from Amazon and iTunes. See Music page for album details. 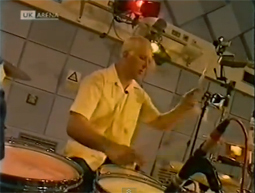 Watch SWAG play "I'll Get By" on the Conan O'Brien Show, 2001. Buy Robert Reynolds' CD "Audrey In A Dream" here - featuring Paul Deakin & Jerry Dale McFadden. Tracklisting info is in our News archive. You can also purchase Jerry Dale McFadden's "This Girl" album from Amazon.com & Amazon.co.uk. May 11, 2018: Listen to Scotty Huff's latest podcast in which he has a conversation with Raul Malo. Email rergalleries@gmail.com. See our Music page for background info on Robert's two previous solo CDs qand SWAG's CD Catch-all. You can also keep in touch with Robert via his Instagram page or his Facebook. Jul 5, 2017: Scotty Huff is touring again with Jake Owen. 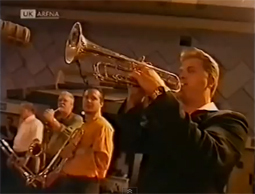 Scotty leads and plays trumpet in the Hell Yeah! Horns with Jovan Quallo (tenor sax) and Josh Scalf (trombone). Jan 5, 2017: The title track of the upcoming album 'Brand New Day' was played on BBC Radio 2's Bob Harris Country on Jan 5, 2017. In between the songs Bob Harris talked to Raul Malo and Eddie Perez. The three songs played were: Stories We Could Tell, Come Unto Me (live), Brand New Day (track from the upcoming eponymous album). Dec 10, 2016: The Mavericks have now opened a new online store with some fantastic new merchandise..
Dec 7, 2016: Nick Kane is now in a new band - Smoky White Devils. Catch them on Dec 17 at the 5 Spot in Nashville. More information and updates are to be found on Nick's Facebook page..
Aug 2, 2016: Scotty Huff appeared on Good Morning America on Mon Aug 2, 2016, as part of Jake Owen's band. 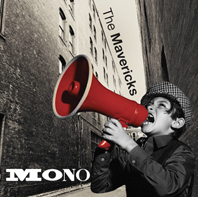 Jun 27, 2016: The Mavericks have their own recording label - Mono Mundo Recordings. The first record will be All Night Live (Vol 1), which will be released on October 14, 2016. Full information here. Sad to see Robert Reynolds airbrushed out of the names of the founding members of The Mavericks. lMar 24, 2016: Watch the new official video for The Only Question Is on YouTube. Includes the Texas Rollergirls. Mar 23, 2016: Scotty Huff will be touring with Jake Owen from mid-May 2016. Dec 31 2015: Robert Reynolds now has an Etsy page to sell his artwork - and that of partner Michelle, who specialises in paper craft. Visit and see some beautiful artwork. Also check out Robert's Instagram page and his Facebook page. His email address is frequently mentioned so you can order that way also. 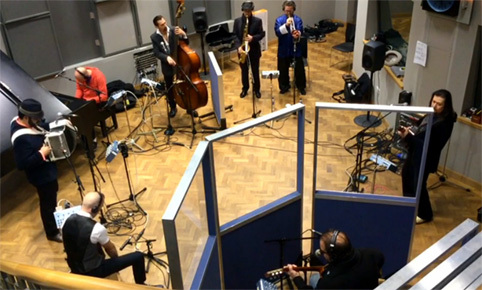 Nov 16, 2015: Raul Malo and Paul Deakin appeared on the Jools Holland show on BBC Radio 2 at 23:00hrs on Mon 16 Nov 2015. The show is now archived, but may not be available in all countries. Click here to listen. It was recorded in London on Sep 10, 2015. For drummer Paul Deakin, his Mavericks show Friday night at the Hard Rocksino is a homecoming. Despite what his 'official' band bio says, he's a Northeast Ohio boy. "When I was 9, I moved from Painesvile, Ohio, to Miami", he said in a call from a Nashville tennis court, where he'd just gotten in a couple of sets with a friend. "I was born at Rainbow Babies and Children's Hospital." "I delivered The Plain Dealer'' he said, proudly (as well he should!). He and his older brother would load up a wagon and traipse through their neighborhood, stuffing the paper in those Plain Dealer boxes that have all but disappeared. Now this isn't the first time he's been back to Cleveland – he had a heart valve replacement at the Cleveland Clinic in 2000 – but this gig IS a first for him. "I've never played my hometown", he said, although he did recall the band did play some fair south of the city. The award means the band, which won a 1996 Grammy for Here Comes the Rain but perhaps is best known for the single All You Ever Do Is Bring Me Down with accordionist Flaco Jimenez, did the right thing by getting back together. "I wouldn't say that that's the only thing that validates the reunion", Deakin said. "It's just an acknowledgement of the work that you've been doing. We're not just a reunion band - we've created a second chapter to this music after taking seven or eight years off. We grew as human beings and musicians.'' Really, it probably was predestined that the band would come back together after the breakup, during which Malo produced several solo albums and Deakin and the rest of the band played with other groups. Click to view the Mavericks' latest video - Pardon Me. 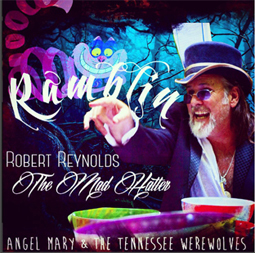 Robert Reynolds appears as The Mad Hatter in the new music video by Angel Mary and the Tennessee Werewolves for their new single 'Ramblin'. This was recorded in Nashville in August 2015. Click to watch the official Ramblin video on YouTube. Also in the video you'll be able to see the famous Manuel, outfitter to the stars, as The White Rabbit. 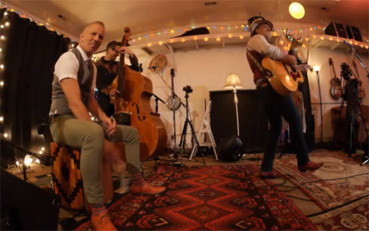 Oct 3, 2015: There's a wealth of archived shows at present - now we have the Mavericks' appearance at Hardly Strictly Bluegrass in San Francisco on Friday October 2, 2015. Click to watch the one-hour set. Songs played were: All Night Long; Summertime; Stories We Could Tell; What You Do To Me; Fall Apart; Harvest Moon; Guantanamera/Twist and Shout; Back In Your Arms Again; As Long As There's Loving Tonight; All You Ever Do Is Bring Me Down. You need to enter "Mavericks" in the search box - for some reason their name isn't in the list of artists to select from. Should be viewable in all countries. 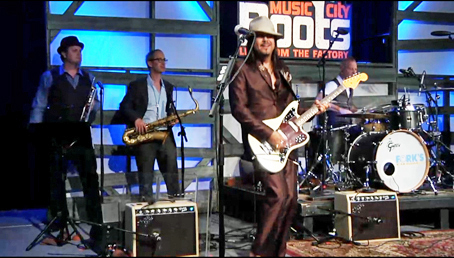 The Music City Roots show from Franklin, TN is archived and available now. Either use this direct link or go to the MCR Livestream page and scroll down to the show for Sep 17 2015, The Mavericks' 50-minute set starts at 1h 59 in the recording. It's archived for some weeks, so you can go back and watch it a few times. It should be available in all countries. Songs played: Back in Your Arms Again; Stories We Could Tell; What You Do To Me; The Only Question Is; Come Unto Me; As Long As There's Loving Tonight; I Said I Love You; All You Ever Do Is Bring Me Down. Fabulous show, don't miss it. All You Ever Do Is Bring Me Down. 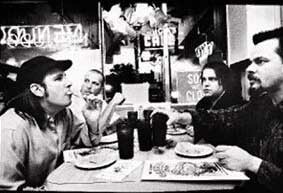 Photo shows (L to R): Scotty Huff, Max Abrams, Eddie Perez, Paul Deakin. 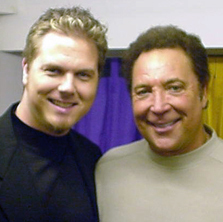 Scroll down the page for a photo of Scotty with Tom Jones. Sep 13, 2015: Click here to WATCH or click here to listen to the six songs played at Proms in the Park, London, Saturday Sep 12, 2015. The video starts with The Mavericks' 30-minute set and runs for 4 hrs, including the Jacksons. *May not be viewable in all countries. With the audio,The Mavericks start playing 11 mins into the recording. Songs played: All Night Long, Summertime, What You Do To Me, Guantanamera, Twist and Shout, Dance The Night Away. Available for 30 days from broadcast. Can be downloaded and kept for 30 days. 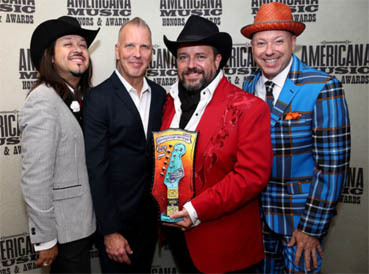 Sep 7, 2015: The Mavericks are nominated for AMA Group of the Year and will be performing at the awards ceremony at the Ryman Auditorium in Nashville on Sep 16, 2015. Watch the livestream of the show by clicking here. May not be available in all countries. These (left) are Artist Trading Cards (ATCs) which are 2.5" x 3.5". Buy either the originals or prints. 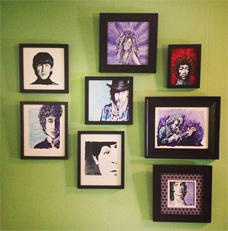 To buy these or other pieces of his art, just visit Robert's Instagram page, where you will find contact details. You can even commission an exclusive piece of art. Other examples of Robert's art are further down on our News page, just scroll down. Scotty Huff with Tom Jones at Riverside Studios, London, Dec 4 1999, when they both performed on the Channel 4 TV show 'TFI Friday'. And now the good news that ex-Mavericks trumpet player Scotty Huff is returning to play occasional shows with the Mavericks, starting on Sep 5 and 6, 2015 (replacing Paul Armstrong). Scotty will also be in the band for the AMA Awards Show on Sep 16, 2015 and Music City Roots on Sep 17. Matt Cappy is performing at other shows. Scotty originally joined the Mavericks in 1997 and stayed for 3 years until January 2001, when the Mavericks took a break. Scotty then spent 3 years touring with Keith Urban, and is currently a composer, producer and performer. Read an interview with Scotty from 2000 on our Press Pages. Watch Scotty with the Mavericks in this hour-long 1998 video, RAW, which is in four parts. See entry on Jan 7, 2015 (below), for some images from the video. Plenty more on YouTube, of course. Including an hour of the show at the Royal Albert Hall, London,1998 You can also find Scotty on Twitter. Last but not least, Scotty plays and sings on the SWAG CD, Catch-all. You can hear his vocals on Track 7, Different Girl. See Music Page for details. Read the review of his 2003 solo CD, 'Assorted' and download tracks from Amazon. Jun 30, 2015: A reminder of a little promo video documentary from August 2008 which is on photographer Deone Jahnke's website, in which Robert makes an appearance. Deone took the photo which inspired the cover artwork for Robert's first EP Audrey in a Dream (2003) and also took the photo of the trees on the cover of Robert's second EP, The Wintersky Works (2005) - images reproduced in our News Archive and Music pages. Visit Deone's website to view the video. Robert appears quite early on, walking and talking (yes, he can do both at once) alongside a creek near his home in Nashville, and being photographed inside his home by Deone. The background music is Near Perfect Smile from SWAG's 2001 Catch-all album, with Robert's vocals. You'll find the original photo from the Audrey in a Dream EP elsewhere on Deone's website. Explore the site, there are some excellent musician photographs to rifle through. Also read reviews of Robert's two CD's, Audrey in a Dream and The Wintersky Works in our Press pages. 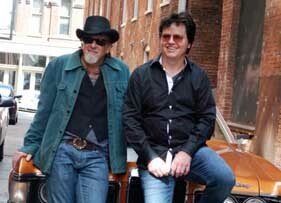 Jun 22, 2015: Way back in 1994, the Mavericks recorded Carl Perkins' Matchbox, with Carl Perkins and Duane Eddy, for the Red Hot and Country compilation CD, which was released in June 1994. Musicians on the record are: Bass, Robert Reynolds; Drums, Paul Deakin; Electric guitar (2nd solo), Duane Eddy; Electric guitar (3rd solo), Nick Kane; Piano, Jerry Dale McFadden; Vocals, acoustic guitar, Raul Malo; Vocals, electric guitar (1st solo), Carl Perkins. Producer, Randy Scruggs. 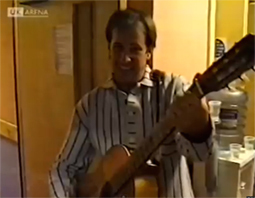 Click here to view a video of their performance at the Ryman Auditorium in Nashville in 1994. Paul Deakin, Nick Kane, Carl Perkins. 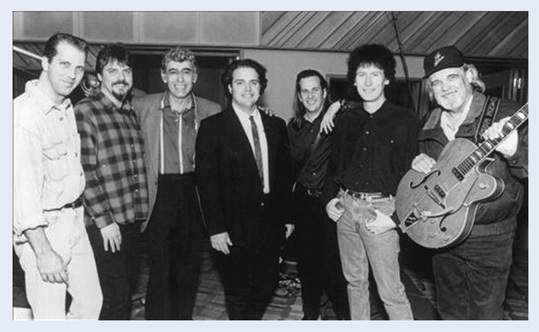 Raul Malo, Robert Reynolds, Randy Scruggs (producer) and Duane Eddy. Not pictured, though he played at the recording session and on stage at the Ryman, is Jerry Dale McFadden. 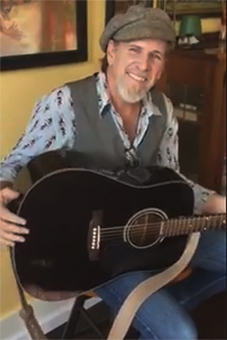 Jun 18, 2015: Watch the new Mavericks video - Summertime (When I'm With You) recorded on Jan 2015's Sandy Beaches Cruise. Bet Jerry Dale needed a drink after that. Jun 8, 2015: Interview with ex-Mavericks guitarist Nick Kane in the Murfreesboro Pulse, June 2015. And you can visit nickkane.com for upcoming shows, etc. May 30, 2015: Background information on the Mavericks is at BMG's site. May 9, 2015: Have a look at this 1996 appearance by the Mavericks at the 1996 Grammy's with Flaco Jimenez on accordion. Nick Kane has a nice little speech he's rehearsing. Also give this a listen - from 1994, a 6-min radio interview with Robert. And, last but not least, there's a 15-min video of Paul Deakin visiting Rob Cosman in his woodworking workshop, November 2013, which you might like. 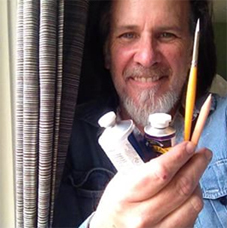 May 8, 2015: A blast from the past - some of you may remember Robert Reynolds and Paul Deakin toured with Kevin Montgomery as the Roadtrippers (and Paint) in 2001, 2003. Here is a video Kevin made in 2000 of his song Another Long Story (4.28). Watch for Robert on the left of the screen at 2min 25sec. 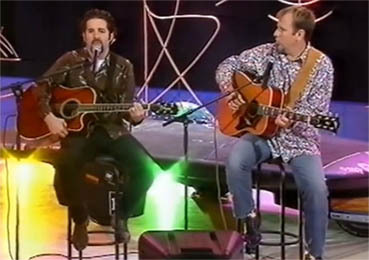 In November 2001, Robert Reynolds toured Australia with Kevin Montgomery. 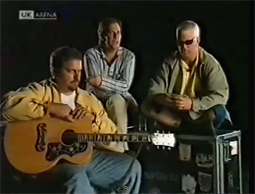 Click here to see a 6-minute video of their appearance on the AM Adelaide show on November 23, 2001. Songs played are I Don't Even Know Your Name and I Wish I Were Blind. Be sure to wait for the second song - there's a gap where it goes blank, you need to wait a few seconds. More information on the Australia trip is on Trampoline, the extensive site managed by Chris Swann, who was with them for the Adelaide area part of their tour. Here's a link to the relevant pages for the Australia visit in November 2001, where you'll find photos and Chris' reviews. Take a look round the rest of the site too. 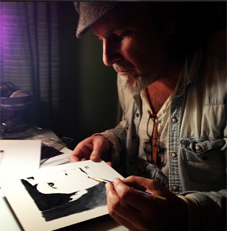 Robert Reynolds is expanding from his 'Under the Influence' series - portraits of musicians who have influenced him - to fruit - and back again via Johnny Cash and Willie Nelson. Update Apr 21: We're currently enjoying some beautiful floral and scenic paintings. Have a look at his Instagram page. Keep checking often, there may be one you want to buy! 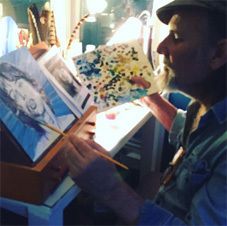 His paintings ARE for sale, and they're going like hot cakes. It would be nice to see prints and greetings cards in the future too. He's also completed a self-portrait based on a photo by Deone Jahnke. Apr 12, 2015: Listen to a couple of tracks from Catch-all on YouTube. 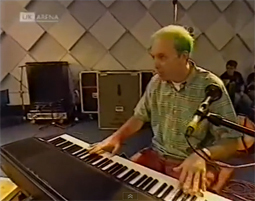 Fabulous singing by Robert on She's Deceiving (3:03) and you can hear Jerry Dale McFadden on keyboards. Robert and Jerry Dale share vocals on You. (4:01) Full details of the CD are on our Music page - scroll down to reach 2001, when Catch-all was released. It is still available as a download on Amazon (see box above) Hopefully this will be re-released as an actual CD in the near future, along with Robert's solo CDs. Apr 12, 2015: Listen to SWAG's version of ELO's Don't Bring Me Down on YouTube. This is from the 2002 Jeff Lynne tribute CD. See Music page for details. Apr 12, 2015: And there's also a 3-part video from 1992 at the Lasso Lounge, Nashville - includes David Lee Holt, of course. London, England, 1998, Mavericks Uncut, broadcast on VH1. The audience included Sir Tim Rice, Mark Hagen (red shirt) and Jonathan Ross. 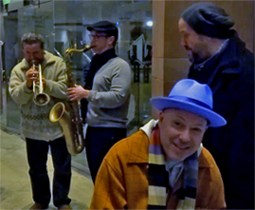 The image on the right shows, L to R, Matt Nygren, Scotty Huff (trumpets), Paul Deakin, Robert Reynolds. Mar 31, 2015: The Mavericks' appearance on Vintage TV, which was broadcast on March 25, 2015 t has now been placed in their archives. Click link below to watch. The video lasts 48 mins, there are other artists appearing also. Recorded on March 19, 2015, at the Tabernacle in London, England. Let It Rain (On Me), and Pardon Me. And Paul is there up at the front on the cajon. This video should be on YouTube soon. Mar 19, 2015: Band page updated slightly. Note: the Band page is really only about SWAG members and is still a work in progress in some aspects. It may be expanded in the future. Mar 18, 2015: The two Mavericks segments of the Another Country With Ricky Ross show detailed below have been isolated from the rest of the show and joined together into an element lasting 34 minutes. It's possible this won't be time-limited but will stay online for longer. Click to listen. Here are the Mavericks in the BBC Radio Scotland studio on February 28, 2015, when they were recording for Another Country With Ricky Ross. Clockwise from bottom left: Paul Deakin on cajon, Michael Guerra, Jerry Dale McFadden, James Intveld, Max Abrams, Paul Armstrong, Eddie Perez, Raul Malo. BBC Radio London: Robert Elms show, 2.39pm, Wed March 4, 2015. BBC Radio 2: Bob Harris Country, 7pm, Thu March 5, 2015. BBC Radio Scotland: Another Country with Ricky Ross - 9pm, Tue March 17, 2015. Still available to watch and listen - See three links in box above. Paul Deakin with new earpieces. Click on the 'Mavericks' link under the video to find the others they have uploaded recently (scroll down past the official ones and you'll find one which Ray Lewis filmed of part of the Bridgewater Hall lobby soiree). 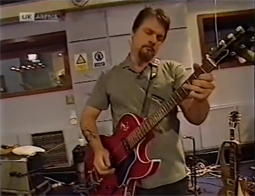 Left: Paul Deakin in the BBC Radio 2 Bob Harris Country studio, Thu Mar 5, 2015. Photo: BBC. 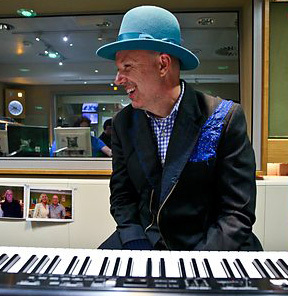 BBC Radio 2's Bob Harris Country had The Mavericks playing live over two programmes hosted by Bob Harris on Thu Mar 5, 2015. The Mavericks' segment started 24 mins into the first part of the show, and lasted 25 mins. Songs played live were Summertime & Out The Door. Bob chatted with Raul about various topics. In the second part of the show, they played Foolish Heart, Pardon Me and Stories We Could Tell - interspersed with some more interesting discussion. Right: Jerry Dale McFadden in the BBC Radio 2 Bob Harris Country studio, Thursday March 5, 2015. Photo: BBC. Mar 4, 2015: Everyone - except Max Abrams, for some reason - went to BBC Radio London to appear on the Robert Elms show at 2.39pm. The presenter played All Night Long, mentioned that the Mavericks were "whipping up a storm" on the tour, and then the band played a very nice version of Summertime live in the studio. Some particularly nice keyboard work by Jerry Dale, who seemed to have a real piano in there as opposed to the Argos mini keyboard he used in Manchester. Mar 3, 2015: Jerry Dale and Paul were interviewed for almost 25 mins on The Afternoon Show on BBC Radio Bristol on Tuesday March 3, 2015. There was a very weird quiz "How maverick are the Mavericks?' Lassoing a horse? Leaving washing-up in the bowl overnight? Paul drinking a Guinness in 4 seconds... while Jerry Dale preferred a pint of whisky. Archived for 30 days. The show at Bridgewater Hall, Manchester was cancelled due to a burst water main. Very fortunate that both the venue and the band had Monday March 2, 2015 free so it could be rescheduled. 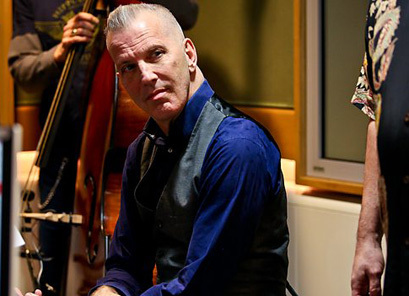 Feb 27, 2015: Prior to their scheduled appearance at the Bridgewater Hall, Paul, Jerry Dale, Raul and Eddie appeared on the Becky Want show on BBC Radio Manchester at 13:44hrs. Their 10-min segment started with the track Dance The Night Away, and then Raul talked about Mono and Paul & Jerry Dale going shopping in Argos to buy the new battery-operated keyboard Jerry Dale brought with him, which he said he was so they were able to play Summertime live in the studio. Presumably Paul had the Cajon with him. When Becky mentioned that the Bridgewater Hall was a seated venue, Paul said 'It's OK to dance, we're putting a Dance Alert out.' 'Spontaneous, joyous dancing may erupt at any moment.' said Jerry Dale - whose keyboard playing impressed Becky Want. Click to listen - it's archived for 30 days. They're 'uncategorisable', as Paul said. Feb 11, 2015: Nick Kane is playing at The 5 Spot Live in Nashville at 9pm on Friday 13 February 2015, in the Black Sabbath Tribute Band, 'Figure in Black'. Jan 28, 2015: James Intveld replaces Jay Weaver on double bass from the Sandy Beaches Cruise January 2015 onwards. Jan 9, 2015: Transcript of a radio interview with Robert and Paul added - broadcast on BBC Radio Merseyside on July 22, 2013. Click here to read it. RAW part 1: Tell Me Why, Dance The Night Away. RAW part 2: La Mucara, I've Got This Feeling. RAW part 3: Dream River, Fool #1. RAW part 4: I Should Know, (Tonight) The Bottle Let Me Down. Dec 25, 2014: Some throwback photos to help spur Robert on, with everyone's best wishes. "Holding darkness up to the light, the other side shows through" - Sugar Blue, Jeff Finlin. Right: No, it's not the latest NASA space crew. Nick Kane, Robert Reynolds, Raul Malo and Paul Deakin at the Mark Collie Celebrity Race in aid of diabetes, September 1994. Raul came second. Above: From the Buddy Holly Tribute Tour 1994. This is at the Col Balroom, Iowa. 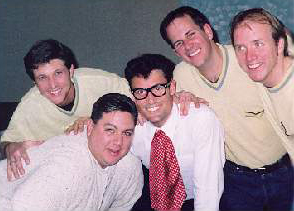 Also in the picture with Robert are, L-R: Ken Loveland, Ernie Valens, John Mueller (as Buddy Holly), Jack Leaver. (Pic: J Caryl) See below for information on this tour. Background to Buddy Holly Tribute Photo above: In 1994, on the 40th Anniversary of Buddy Holly's death, a group of artists relived the last days of his life. Robert was one of those who traveled to replay 7 of the last 11 dates in the same cities Buddy played - with the same shows and mostly in the same venues as they had been played 40 years before. Ernie Valens, Ritchie Valens' nephew, was also on the trip and sang Ritchie's songs. John Mueller, an actor who has played Buddy Holly on stage, portrayed him throughout the tour, with Robert playing one of the Crickets for the first two shows. 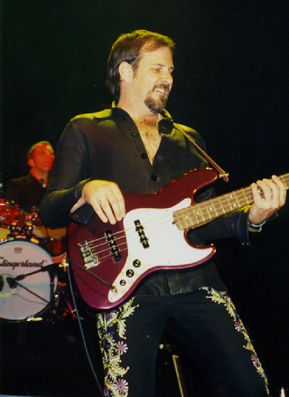 Robert took the place of Waylon Jennings, the original bass-playing Cricket, for those two shows and increased involvement in the last five shows by becoming the opening band - he had the chance to play with his longtime friends Ken Loveland and Jack Leaver... they played songs from the same musical year. The last night of the tour was at the Surf Ballroom in Clearlake - Robert, Ken and Jack had the opportunity to perform the whole show since John Mueller had lost his voice. After the concert weas over, they went to visit the crash site and spent a few minutes remembering not only Buddy, but Ritchie Valens and the Big Bopper, who also died that night. It was a powerful moment for them all and a memory they will never forget. Nov 20, 2014: Click here to listen to a recording of the Mavericks' 15-minute appearance on the Grand Ole Opry on Tuesday November 18, 2014. Click forrward until about a third along. They play Back In Your Arms Again, All Night Long [from the new album], and All You Ever Do Is Bring Me Down. The Mavericks Return With New Album, Plot World Tour - Eclectic group follows up reunion LP 'In Time' with 'Mono', but loses member Robert Reynolds to family matter. 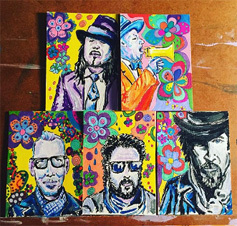 Few artists can evoke a sense of a time and place as adeptly as the Mavericks. With their Latin-inspired blend of country music, and singer Raul Malo's huge voice, the group conjured magic on 2013's In Time, the band's first album together in nearly 10 years. Last night during a performance on the Grand Ole Opry, the Mavericks announced the arrival of In Time's successor. Titled Mono, the project will be released February 17th. 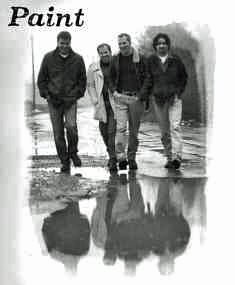 Back in May 2001, Robert Reynolds and Paul Deakin toured Europe with Kevin Montgomery and Doug Pettibone - as a band called Paint, which was the precursor to Kevin Montgomery's Roadtrippers, though not their first time in the UK with Kevin. The Paint tour dates are now way down at the bottom of the Shows page, to fill in a gap in the 'Robert and Paul' musical history. This 2001 Paint tour of Europe was slotted in between two parts of a SWAG US tour which ran from March to September 2001. On the right is the cover of Paint's 4-track CD, which was available at the shows. 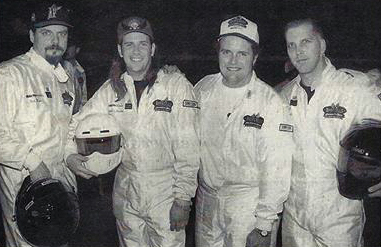 Pictured: Doug Pettibone, Robert Reynolds, Paul Deakin and Kevin Montgomery. More information on the CD is at Chris Swann's extensive Trampoline site. PS: You'll find a few of Robert and Kevin's Australia shows in November 2001 on the Shows page also. There are gaps, so assistance is welcome in filling them in. An old TV interview (in three parts) with Robert Reynolds and his first wife Trisha Yearwood on "Straight from the Heart" is on YouTube. 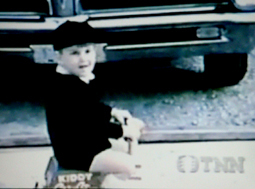 Here's a still from one of the video clips they feature in the show - Robert as a small boy on his tricycle. There's also a Batman cape episode where he jumps off a chair. Sep 17, 2014: Reminder: Nick Kane is playing at The 5 Spot Live in Nashville on Thursday September 18, 2014, with two new band members - Grant Collier on drums, and Parker Hawkins on bass. Part of the Rocking Roots Guitar Showcase. Starts 1700 hrs. Background: Born in New Jersey and raised in Germany, he toured Europe with rock bands throughout the late '70s. 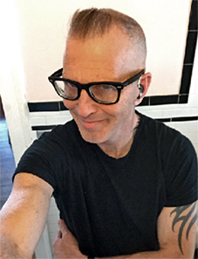 In the '90s, Nick played in a Miami punk band, The Preachers; a Florida blues band, Iko, Iko; and a New York blues group, Little Mike and the Tornadoes. In Los Angeles, he teamed up with former members of the Meters and Tower of Power, and he was in a rock band with former David Bowie sideman Hunt Sales. He also spent seven years with The Mavericks. You can listen to some of Nick Kane's music at his Reverbnation page. More information on the Trampoline website. Sep 16, 2014: News from 2008 to 2012 is now added to the earlier News Archives. This current news page now only goes back to January 2013. Have a look back at some of the early news, there may be something you didn't know about. Aug 20, 2014: Since the August 13 entry below reminded me of the other official videos, I decided to get them on here. So, let's start off with Things I Cannot Change (3:33) - from 1999. Look out for Scotty Huff (sleeping/dancing, wearing the pork pie hat), and Jaime Hanna sleeping in the car covered in dust, Ericson Holt as the fireman (he played keyboards with the Mavericks at the time - Jerry Dale McFadden was off playing with Sixpence None The Richer). Robert's brother Michael is shown waking up on the car near the end, and also Jason Lewis is asleep on a motorbike, musicians from Scottish band The Felsons are in there, and various other people are dotted about in this video too. Let me know if you know of others. Dance The Night Away. (look for Raul's sister dancing and Paul dressed as a woman in this one). And from 1999 Here Comes My Baby (3:10). 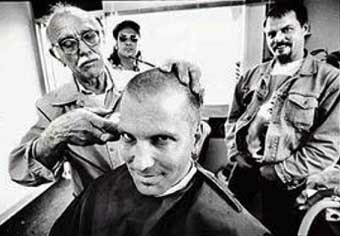 Just re-discovered this old photo (right) of Robert Reynolds, Paul Deakin and Nick Kane, circa 1996. I Don't Care If You Love Me Anymore, 1996. Here's one from the show at Harrisburg, PA, Friday August 8, 2014, which lasts 1hr 19mins. Another long one is from The New Orleans Jazz and Heritage Fest, Saturday April 26, 2014, and lasts 1hr 9 mins. Jul 27, 2014: The Archived Shows section, 1994-2004 & 2012, has been updated with some shows which have surfaced from old paperwork, but there are still some missing ones - can you assist, or will the list never be complete? You can also buy Robert's 2003 EP, Audrey in a Dream - Go to our Music page for details. Jul 10, 2014: Flashback to 1991 - here's a 20-minute video from February 11, 1991 at the Yesterday and Today Records grand opening ceremony. Includes Ben Peeler. Jul 5, 2014: The Mavericks have covered "Dr Feelgood" - with a twist - for the album Nashville Outlaws: A Tribute to Motley Crue. You can watch a short video where Motley Crue discuss the Mavericks' version of Dr Feelgood on YouTube. It's due for release on August 19, 2014 - click to buy the full album or just the Mavericks track on Amazon. Jul 5, 2014: There's a happy little 5-minute interview for you to watch which was conducted on the Mavericks tour bus at Dauphin's Countryfest, Dauphin, MB, Canada, June 29, 2014. 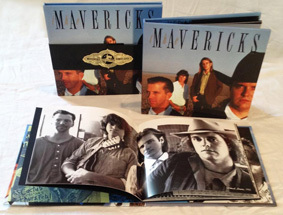 The Mavericks have re-packaged their first album, The Mavericks, (originally released in 1990) and it now comes complete with a 24-page booklet containing old photos and flyers. It's priced at $25 and is available at shows and at the Mavericks Store and will be available from all the usual outlets in due course. Some of you may recall that Ben Peeler was the lead guitarist at that time. and Robert Reynolds on guitar. The cajon is a box-shaped percussion instrument from Peru. Just so you know. 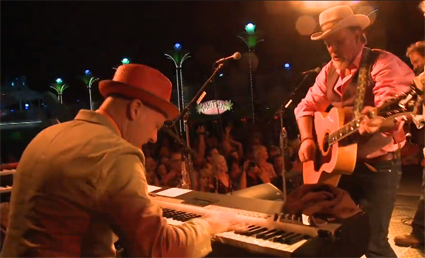 From The Mavericks at Skyville Live webcast, streamed by yallwire.com, Thursday June 26, 2014. View the full 56-min webcast on YouTube. Setlist: Back In Your Arms Again, What Am I Supposed to Do Without You, All Over Again, Pretend, Every Little Thing About You, Happy Birthday [to Eddie], There Goes My Heart, Fall Apart, I Guess The Lord Must Be In New York City, She's About A Mover, Think Of Me (When You're Lonely), Volver, Volver. May 25, 2014: Ex-Maverick Scotty Huff is working on his 22nd soundtrack for Scholastic films. "Very Fairy Princess" is based on a book written by Julie Andrews and daugher Emma Hamilton. On Scotty's website, click on 'Services' to find details. In the past, Scotty and Robert Reynolds have written and recorded many soundtracks for children's videos - see Robert's page on the Australian Trampoline website for info... scroll halfway down for the details. Past the Jerry Dale McFadden record, there are others. May 12, 2014: Ex-Maverick Nick Kane is playing at The Family Wash, Nashville on Saturday 31 May 2014. Apr 30, 2014: I Met A Beatle. Read Robert Reynolds' account of meeting Sir Paul McCartney in London in 2000 - as published in the British Beatles Fan Club magazine, Christmas 2000. Go to the Roadtrippers photos page to read the article..
Apr 4, 2014: Just announced, Manuel's 81st birthday celebration, taking place on April 23, 2014 in Nashville. See Shows page. Mar 28, 2014: Raiders of Rock - CMT, Wednesday April 2, 2014, midnight. CMT is finally showing the first two episodes of Robert Reynolds' 10-part series Raiders of Rock. First show is midnight, April 2, 2014. Read all about it on CMT's site. There are six new photos of Robert and Stephen Shutts on there. Episode 1: Musical Marvels. A Kiss fanatic wows the guys with his over-the-top collection, and Rockology customers surprise the guys on many levels with Taylor Swift, REM and Michael Jackson pieces that may be too big to pass up. Episode 2: Rock 'n' Roll Gold. It's all about Elvis, Johnny Cash, Jason Aldean, Brad Paisley and Rascal Flatts when the guys track down several pieces of rock'n'roll gold in this must-see episode. Episode 3: Rare Rockin' Relics. Rare relics from Pink Floyd and Paul McCartney are sure to blow the guys of Rockology away. Episode 4: Lucky in Los Angeles. Rockology makes a trip to Los Angeles to check out a very personal Guns n' Roses collection. meet with the queen of the groupies and dive into an intense negotiation on high-dollar rock 'n' roll T-shirts. Episode 5: The Musical Jackpot. A rare Nirvana poster's price and significance put Robert and Stephen at odds, while a music executive's mass collection leaves them almost speechless. Episode 6: A Lynyrd Skynyrd Lead. The devil is in the details as the guys check out a lead on a Lynyrd Skynyrd poster and an Elvis piece that may force them to leave empty-handed. Episode 7: Distinctive Discoveries. Set lists from Bruce Springsteen; clothes from Tommy Lee; Beatles candy. Episode 8: Musical Diversity. The guys check out items from Porter Wagoner, Hank WIlliams Jr., AC/DC, Bruce Springsteen and Elvis to invest in for Rockology. Episode 9: Nashville Treasures. Robert and Stephen head out to a couple of Nashville's best antique malls and flea markets in the hope of finding some unique musical treasures and another lead has at least one of them crooning over an old golf cart. Episode 10: Kiss and TX Flea. A KISS collection. Also visits to Texas flea markets. Also you can click here to go to the News Archive for August 7, 2012 for the earlier information on Raiders of Rock, which was originally to be called Rock Raiders. Feb 3, 2014: Nick Kane is again appearing in his regular slot at The 5 Spot Live in Nashville on Tuesday February 4, 2014, with Steve Latanation, Mark Robertson and guest Sonny George. Event hosted by Derek Hoke. Buddy Holly died on February 3, 1959. Click here to read an interview with Robert Reynolds where he discusses Buddy. 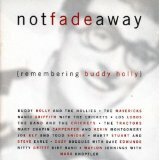 Cast your mind back to January 1996... the release of Not Fade Away: Remembering Buddy Holly, on which The Mavericks played a fabulous version of True Love Ways. The whole album is excellent. Buy it from Amazon.com or Amazon.co.uk . Jan 31, 2014: While we're doing videos, here's Pretend - 4:31 video from Gruene Hall, New Braunfels,Texas, October 10, 2013. There are now five excellent videos from the January 2014 Sandy Beaches Cruise (SBC20) now on YouTube. There are also videos on there from 2013's cruise (SBC19). pictured on the pool deck on the Sandy Beaches Cruise. Jan 7, 2014: Read a fabulous review of In Time at Saving Country Music's website. Jan 6 2014: Quentin Ware (trumpet) has left the band and has been replaced by Tyler Mire [update: now Paul Armstrong], and Elio Giordano (double bass) has also left. Elio's replacement is Jay Weaver.